enhanced by a maple vinaigrette dressing. Stir constantly, watching closely until sugar is completely melted and coats the pecans. Turn pecans out onto waxed paper and let cool. Serve with Maple Vinaigrette on the side. 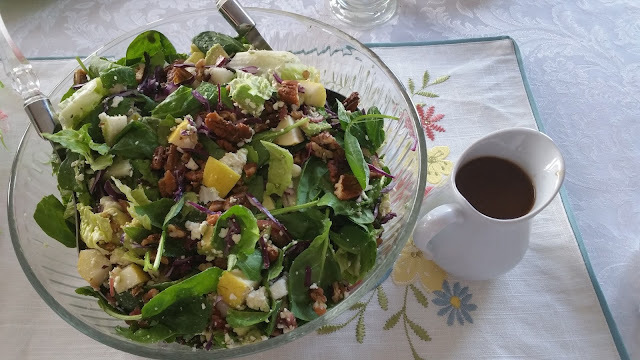 Or you can toss the salad with the dressing and top with the pecans just before serving. Whisk together in a bowl, the vinegar, mustard, salt and pepper and maple syrup. Gradually whisk in olive oil mixing well until emulsified. Pour into a pitcher or cruet and serve alongside salad. Lovely recipe, I make one almost the same but every so often I will use blue cheese instead and it's very nice too. Maple dressing is our family's favourite, I use a bit of dry mustard and some garlic in mine but otherwise almost identical. I happen to have some maple sugar on hand. Wonder if that could be used in place of maple syrup? I don't know - it could very well work - try it and let us know.